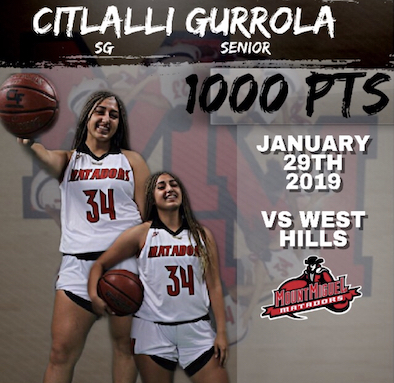 SANTEE – Mount Miguel senior guard CITALLI GURROLA surpassed 1,000 career points in an 81-19 Grossmont Hills League road win over West Hills on Tuesday. Gurrola, who transferred to Mount Miguel from Mater Dei Catholic before the start of her junior year, is a senior. Her accomplishment comes just one game after sophomore teammate SYLENA PETERSON also passed the 1,000-point plateau. Gurrola’s three-point shot has been hot of late and she continued that shooting prowess right out of the gate in the first quarter on Tuesday night, making four three-pointers in the first period. “It feels amazing to be in the 1,000 club,” Gurrola said of her accomplishment. “We just finished celebrating Sylena’s 1,000 points a couple of nights ago and Coach Rob (Sandoval) told me I wasn’t that far behind. “I’ve been celebrating tonight with my family and friends and enjoying the moment. “I wasn’t keeping track and I was surprised because I sat out the majority of my freshman year. I’m very grateful and thankful to God that I haven’t been injured and I’ve been working very hard and shooting with confidence. Peterson led the Matadors with 23 points, including a trio of three-pointers. She also had seven assists and eight steals. Freshman forward JAPONICA MELVIN had one of her most productive scoring games of the season, finishing with 14 points and eight rebounds, six of the boards coming on the offensive glass. Senior guard TIAJA BENNETT added 11 points for Mount Miguel. She also knocked down three three-pointers and had seven rebounds. Senior guard MICHELLE CORLEY also had two three-pointers, as the Matadors made 14 field goals from behind the arc in the game. West Hills was led by PAIGE EVANS’ five points, while teammate ANASTASIA TIMOTHY added four points and four rebounds. Mount Miguel improved to 6-0 in the Grossmont Hills League.